Starlight Glimmer - Is her name Mary? starlight glimmer Starlight Glimmer - Is her name Mary? I consider myself a reasonable person. Who doesn't? SPOILERS for 3rd Equestria Girl Short. STOP NOW if you don’t want them. I’ll remove this WARNING when the episode airs. 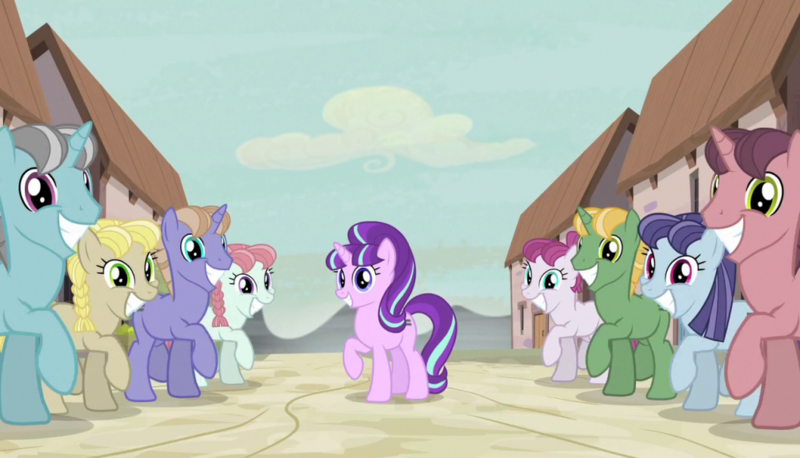 Starlight Glimmer was introduced, among other reasons, to help be new viewer’s guide to the show. I get that. It’s a great idea. Bravo. The more the merrier. More people means more ratings. More ratings means more episodes. Maybe even Equestria Girls the series. I recently had the chance to watch the 3rd Equestria Girl short, and I was pumped. I was hoping we’d have Twilight Prime or Celestia run into Sunset. Maybe have that wonderful heartfelt “I was wrong!” “I know” moment we all in one way or another, envision! I was extremely disappointed. Not because I didn’t see any of that. I’m fine with that. More suspense the better. First. Lets recap Starlight Glimmer. I’ve said in my early reviews when we first met Starlight Glimmer that my first impression was that of joy. Starlight was presented as a veiled homage to both Socialism and the Rise and Fall of the Soviet Union. I loved that. She had no regrets about what she was doing. She thought she was doing the right thing. Most well rounded villains do. She used a Plot Device to steal Cutie Marks and make everyone Equal. Because when everyone’s equal, no one is better. That's the problem with socialism and communism however, it’s never that easy. There’s always someone in charge. Corrupt most often than not, who keeps the status quo with the help of devoted brainwashed minions. The same was true in Starlight’s village. When the whole thing comes crashing down around her, she does what any good villain does: she runs. When cornered, she tries to flat out KILL the Mane 6. If Twilight hadn’t had her barrier spell, she would have succeeded. Then came the moment of truth. 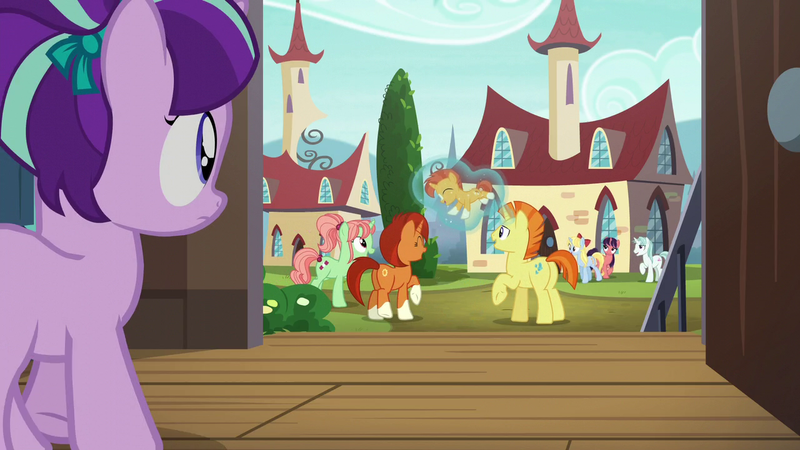 The moment I might add that Sunset Shimmer (who I’m convinced was a prototype for Starlight) choked at. When classically our villain should have a small breakdown and repent, and be accepted and not executed for their crimes, Starlight does not. I was overcome with hope that we’d finally gotten on the right path of balancing realism and cartoonism lessons. She does, quite frankly, what I would have done. For the rest of the season she spies on Twilight and her friends to find out just HOW they beat her, and what she can take away from Twilight to make her feel as awful as she does. Thus making all things equal again. She then waits for the proper moment and tool to strike with: The Time Spell we all but forgot existed from seasons past. Using it, she does, again, what I would have done: she goes back and stops the Rainboom that began the lives of all the Mane 6 from happening. Problem solved. The final part of any revenge plan is to make sure your target knows who destroyed them. Often a pitfall of villains, but still important. What goods the work if no one knows? So Starlight does in fact, let Twilight know who is responsible. Then the moment I personally was waiting to find out: What horrific event made this monster? Villains aren’t born. They are made. Something tragic usually. Personal, and always life altering. Starlight gives us her backstory, finally, and despite the fact it kind of resembles what I thought was going to happen to the Cutie Mark Crusaders when one got their mark (by the way, what a cop out :P) it was comic book perfect. We learn that unlike the wonderful happy friends that the Mane 6 are, Starlight didn’t get her Cutie Mark when her best friend did. When he did (which apparently was for being able to sort by the dewey decimal system I guess?) his family showered him with enough praise and uplifting that anyone would be upset, let alone our villain. He quickly disappeared out of her life, leaving her alone. The most important thing to any pony, had made HER the most miserable one. She didn’t want that to happen to anyone else. So she started (with Maud’s help it seems) her plan for the village. Then it was destroyed by Twilight, making it extremely personal. Bringing us to the end of that season where Starlight is literally inches away from winning, and she chokes. Somehow, the Magic of Friendship wins, making her an instant friend. I’m all for the lesson that “why make enemies when we can make friends” don’t get me wrong. It’s something that needs to be instilled more and more each generation. But, we can’t be so naive to let the lesson be that if you try hard enough it will ALWAYS happen. So, thus Starlight joins our merry crew of ponies and despite the fact she’s new and knows she makes mistakes, she’s able to learn fast! She learns in half a season or so what it took us 4 seasons to teach everyone else, and THEY are supposedly the elements avatars. Starlight is not. Yet there she goes, excelling. 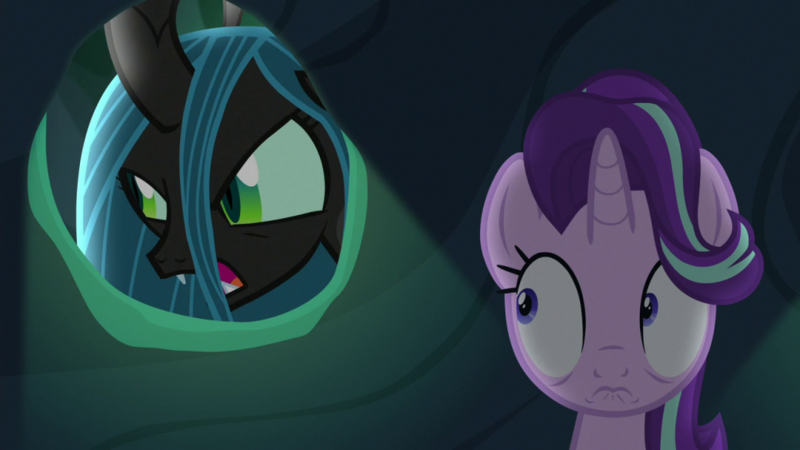 The unthinkable happens: the 2 demigod like sisters, Luna and Celestia, and everyone else that actually matters to the world, are replaced in a two parter that I loved as a callback to Invasion of the Body Snatchers. The Queen who was in the finale of season 2 came back and hatched an evil scheme, and unlike Starlight, actually did something right. Gathering the best of our backdoor favorites: Discord, The Great and Powerful Trixie, and Thorax who gets the silver medal one becoming the fastest friend we EVER pick up, form a Suicide Squad to get everyone back! Because if a seemingly immortal alicorn, her sister, and her student, her student’s hand chosen friends and the rest of the royal family can’t, clearly what we need are Jobbers But I’ll be damned if they don’t pull it off, thanks to STARLIGHT’S plan. Which looks like she’s making up as she goes along. 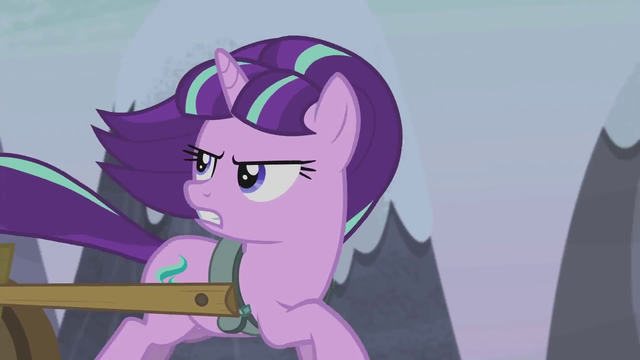 Let's quickly summarize: Starlight enslaves a town in such a way they thank her, she’s thwarted by Twilight and company, she then escapes without reforming. She then returns and execute a perfectly timed plan using time travel to undo her opponents before they even become, celebrates her victory in front of Twilight. Twilight gives a speech, Starlight see’s the errors of her ways and all is forgiven. 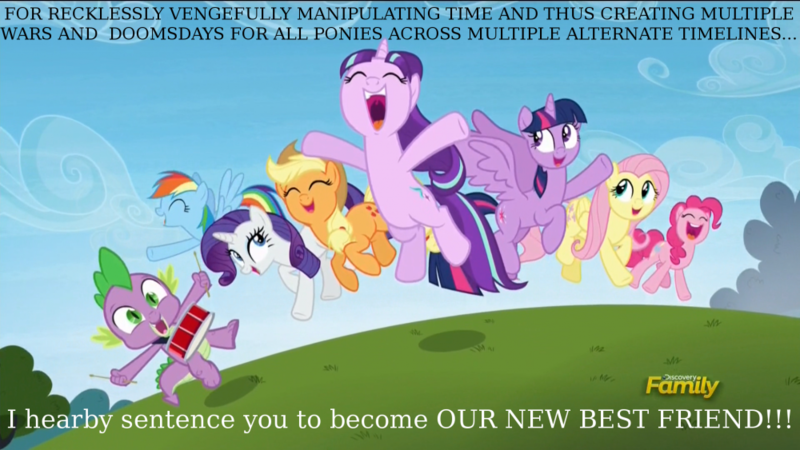 She then turns into the 7th pony in half a season. She then saves the entire kingdom of Canterlot, neigh say, the world, with the help of tertiary characters and her wits. This sounds remarkably like a literary trope I was once warned about. Now, all that behind us. Let's go to the Equestria girl short #3. Sunset goes through the portal and meets the only person apparently minding the castle, Starlight Glimmer! She then returns with Sunset (because who's going to steal a castle!?) and adapts way faster than Twilight, who for all intents and purposes, is third in line for wisdom at this point, and has just an awful set of jeans. Sunset and Starlight hit it off, I can honestly forgive this given their similarities. What happens next is the issue.  So the Monster of the Week, Juniper something or other, has trapped Sunset’s friends in a mirror. Seems villainy enough, right? Ok, so then Sunset goes to confront her, and knowing very well how dangerous magic can be, and having beaten three CLASS A supervillains across as many movies, is sucked into the mirror as well. Starlight is now left alone in an alien world with no magic and only her wits. The two square off and play an amusing game of round and round we go, followed by the most atrocious thing I’ve seen since they let Sonic SatAM just STOP with a cliffhanger: Starlight pulls a card from the bargain bin of solutions and does exactly what Sunset did to SciTwi. She tells her that there’s another way and let me show you, paraphrased of course, but that's it. THAT'S it! We get a Darth Vader moment where the villain proclaims it’s too late, but then that's it. NO FIGHT. No CONFLICT. Not even danger. Starlight singlehandedly comes to a world she literally knows NOTHING about less then two hours ago, gets some ice cream, fights a resident villain of that world on their own turf, and simply TALKS THEM DOWN..and then makes them a friend! Starlight has been able to do all these things and we’ve known her, what two seasons MAYBE? 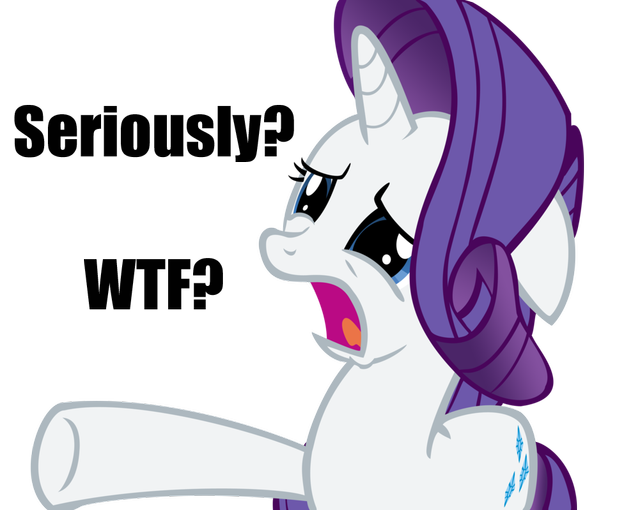 5 seasons it took the mane cast to get to the point they are, Starlight takes course by mail and she’s surpassing them after less than HALF the time it took the best of the best? Yet everyone I see talking about her for the most part just loves her. I can either conclude two things: Characterization has taken a great fall in the minds of this latest generation or they don’t know it’s an awful character. If the rest of the show was as poorly written and executed as Starlight, I could see that as no issue. But it’s not. It’s a rich show, with excellent writing. HOW this happened and WHY more people aren’t seeing this, is beyond me. So I end this with an open friendly, mind you, challenge. If you care enough to get to this point in the article, you’ve no doubt got a very well thought opinion of this one way or another. Am I looking at this character the wrong way? If so, please, PLEASE, I welcome constructive input in the matter to help me see it another way. I don’t want FLAMES. I want civil discussion. Previous entry Pony Think Tank tackles "Celestial Advice and Bottled Up"
Next entry Pony Think Tank tackles "Dance Magic"
Can't comment on your thoughts for the EQG special, sorry. Only read a bit of that but I'd rather not get spoiled. As for the rest of your argument...Sorry, I can't see how Starlight could possibly be a Mary Sue. Yes, she's powerful. Yes, she's talented. She's also one of the most flawed characters in the show. Even after her reformation she struggles with herself regularly, she constantly slips into her old habits of abusing her magic and manipulating others around her, she's impulsive and doesn't fully think through the consequences of her actions, she's had issues controlling her anger, etc. She didn't learn how to fix these things quickly either, she's still struggling with them this season too as Episode 10 "A Royal Problem" shows, and while that episode ended well and her impulsive decision turned out to be the right one, it was still an impulsive decision that could have gone awfully wrong. She later in the episode has an awful nightmare about it too, literally beginning to believe she's going to cause the sisters to turn into their Nightmare selves. She's her own harshest critic. Starlight's got a lot of good things going for her, but she's got too many flaws and imperfections for me to consider her a Mary Sue. It's those very flaws that have made me adore her. The flaws you point out, if thats what they are, can they then justify the seemingly over the top moments I've described not counting the Eqg special? You raise a good point with the flaws however. Those seem to be rather convenient when the story calls for it at times, but still, they are present. That a got me thinking now. So woth this in mind, anyone else? I wouldn't say her flaws are "Convenient", they pop up in basically every episode she's in. Her abuse of magic shows up in "No Second Prances" when she forces Big Mac to talk, is one of the main focuses of "Every little thing she does" where she tries to use magic to mind control her friends just to do simple Friendship problems. Which also shows her manipulating others without even realizing the consequences until Twilight and Spike point them out to her, and her self-doubt in that she doesn't even think she can spend time with friends properly without them thinking she's "Bad at it". "To Where and Back again" kind of touches on her self-doubt too, she doesn't even think she can help set up a festival, fearing she'll take control and hurt ponies again. Season 10 has more self-doubt in her feeling she's not ready to leave Twilight yet, and her nightmare about the Evil Princesses that she feels might happen because of her mistakes. Plus, "All Bottled Up" shows her suppressing some pretty clear anger issues that she's not effectively communicating, and again using her magic to solve a problem that she could just talk out with Trixie. She's been working through her issues a bit more each episode she's in. Her biggest enemy is herself, her self-doubt and her tendency to fall back on her old ways. As for her various victories and accomplishments, I don't think any of them are too bad. The first two, her village and her Time-Travel plan were both done when she was a villain, and both times she ended up ultimately "Losing" to Twilight and friends. Well, the second time she stood down. Both plans fit with her talents, she is clearly shown to be both a good leader and good at magic when not doubting herself. As for "To Where and Back again". How's it any different than say, Twilight and her friends going on a dangerous adventure to stop Nightmare Moon or Discord? Starlight uses her wits and leadership skills to help her and the others get through the Changeling Hive, but she never would have made it to the end without the others helping her on her way. She didn't do everything herself, Discord still distracted the guards, Trixie and Thorax lured Changeling's away with their Showtricks and Shapeshifting, etc. Starlight wouldn't have made it to the end on her own, and even at the end she fails to reform Chrysalis, doesn't she? Chrissy smacks that hoof of Friendship away and spits in her face. You know that this sentence is you being very entitled here. I mean, who are you to tell me, what a quality character is supposed to be? You are not better then me, just because i happen to like Starlight Glimmer. It's fine that you have your opinion, but everyones opinion is equally as good as yours. Remember, this is a very idealistic show we're talking about here, where every bad guy has a good heart deep inside of him. Friendship pretty much holds their universe together, with everyone in that universe having a chance to be happy. That's why every episode in this series has a happy ending. How's it any different than say, Twilight and her friends going on a dangerous adventure to stop Nightmare Moon or Discord? The two examples given are acceptable due to the fact she's the main character and our real eyes in the world. Couplednwirh the fact she and her friends are the avatars for the elements of friendship, this seems reasonable. I hadn't taken into consideration the queen shot her down. T hats an excellent point! If I sound entitled it's not my intent and I apologize. Look at it this way: for the most part no one seems to have a problem with starlight. By societal rules, the majority opinion rules and is thus considered the normal or "right" answer. If my opinion is not in line with that so called right answer, then something must be wrong with me. In fact there has to be, because the writers of the show seem to keep writing her this way. I love this fandom and I love the shows. Until about a day ago my faith was solid. If they are right, then I must be wrong. If I'm wrong about this, what stops me from being wrong about liking the ip? I understand as I stated above, that we need to teach the lesson that everyone should be given a chance. The lesson however should also be there that not everyone IS redeemable. If this show is supposedly for kids, what kind of lesson are we teaching if we tell them to blindly try to befriend someone that's clearly a threat. There ARE monsters in the world. Don't assume everyone is but be able to tell when one is a genuine threat beyond redemption. Starlight and the other's victory made sense though, it shows us in the episode how they do it. Starlight's a capable leader, Trixie's illusions turn out to be useful for more than just her stage show, Discord is distracting with or without magic, and Thorax's ability to shapeshift and navigate through the hive. All of these things come in handy, take even one of them off the team and I doubt they would have made it. Obviously the big threats can't just be solved by everypony, but on the other side if we make it so the world's threats can ONLY be solved by the Mane Six...that's a little boring and predictable. What? No, I couldn't disagree more with you here. The majority opinion is not "Right", just because it's a majority. An opinion can't be right or wrong, unless said opinion is something going against concrete fact, and fact isn't decided by how many people believe something. I'll argue with you all day on why Starlight is not a Mary Sue, but you aren't wrong for disliking her. If someone tries to tell you there's something wrong with you because you disagree with them on a cartoon, ignore them. First off, i accept your apology. You seem like an okay and reasonable guy after all. I also apologize if i seemed a bit rude. I just woke up early in the morning when i wrote my comment. Well, everyone has their opinion and like you pretty much implied in your reply, just because there is a majority opinion, you don't have to fall in line with that and i respect that. For example, i never got the big hype around Princess Luna. In my eyes, 80% of the people like her for what she is in the fandom and not the show. I don't hate her by any means, i just don't know why everyone flipsout when she is on screen. I think in this regard, we have to agree to disagree here, because i kinda think differently. I understand where you are coming from. The real world is not black and white and has alot of problems. But that's why i like this show so much. It shows a wonderful and magical world where everyone has a chance to make friends. I know, it's just a TV Show. But for those 20 minutes, i can just lose myself in it. It'sssssss no problem. Maybe you like to look a bit deeper into my eyessssssssss? You're a nice guy. No hard feelings. Here is a better worded breakdown I find very accurate. Not my video but very true.